Happy is made liaison of local affairs for the Maria Stark Foundation. Then Tony has lunch with the Volcanologist who helped stop Firebrand. The meal is interrupted when the kid from last issue steals the dragon statue (egged on telepathically by said statue) and goes on a rampage as he slowly mutates. The rampage is to get money for his sister, the kid blaming himself for getting her addicted to the drugs she overdosed on and nearly died. But while Iron Man defeats him, rats turned into lizards pour out of the sewers and combine with the mutated kid, forming a new body for Fing Fang Foom! What they got right: I don’t know what happened to Foom over the years (like why he was suddenly a dragon statue in a curios shop in Seattle) or if the whole lizard body thing is consistent with his abilities. 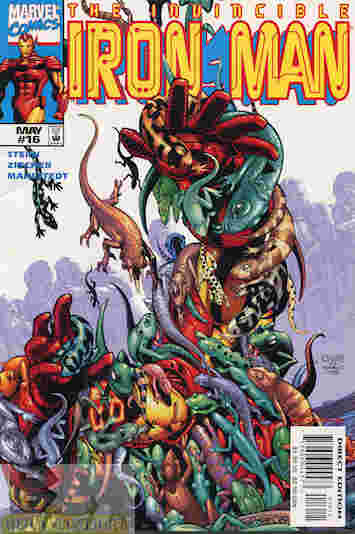 Taken on its own it actually was an interesting story and I do like seeing Fing Fang Foom back. We also get some good character growth for Happy. What they got wrong: Since I don’t know how Foom got into this state or the lizard thing I can’t really complain about anything. If those are off somehow then that would be a mistake. I will note that someone messed up on the narration boxes. When Tony becomes Iron Man the caption usually reflect that (it’s a decent gimmick but not really necessary), but halfway through the book the “Tony” and “Iron Man” colors got mixed up. Recommendation: A good start to this story line. Next issue I believe is the conclusion and if it ends as well as it starts it will be worth checking into. Posted by ShadowWing Tronix on October 23, 2018 in Marvel Spotlight, Yesterday's Comics and tagged Fing Fang Foom, Happy Hogan, Iron Man, Marvel Comics, Marvel Universe, Tony Stark.